Today’s participant blog post comes from Kayci Merritte, a participant of the Yahel Social Change Program. This group is living, learning and volunteering in the Ramat Eliyahu neighborhood of Rishon LeZion for 9 months this year. Within a few minutes’ walk of my shared apartment in Ramat Eliyahu, there is a small collection of stores that sell food, clothes, and household items. While they do have actual names, they have come to known and identified by the group as “The Everything Store,” “The Produce Market,” “The Other Produce Market,” “The Spice Store,” “Ron’s Bakery,” etc. Each shop is generally devoted to selling one distinct service, which I have found has positively impacted the way I shop, most specifically, for my food. In the United States, I consistently, with a few exceptions, bought my groceries from, predictably, grocery stores. Everything I needed was in one place, a few minutes’ drive from my home. Foods I didn’t necessarily need often made their way into my shopping cart, and then into the trunk of my car, and then into my home. In the markets of Ramat Eliyahu, I find that the separation of each store and therefore types of food (produce separated from chips separated from nuts) effects how I shop. I buy significantly more produce than I have in the past, and I have noticed that I am buying “bad” foods less often, as well as the types of packaged foods that would usually end up sitting unused in what is now limited cabinet and refrigerator space. It takes a specific trip to buy these types of foods, so I have much more time to consider if I actually really want them. Some people in Israel label Ramat Eliyahu as a “difficult” neighborhood. When I hear this, I think of neighborhoods in the U.S. that have been described using similar language. A component of this “difficultly” can sometimes be a dearth of resources and basic goods, with easy access to fresh, unpackaged foods predominating. “Difficult” and “Food Desert” have been used to describe the same places. 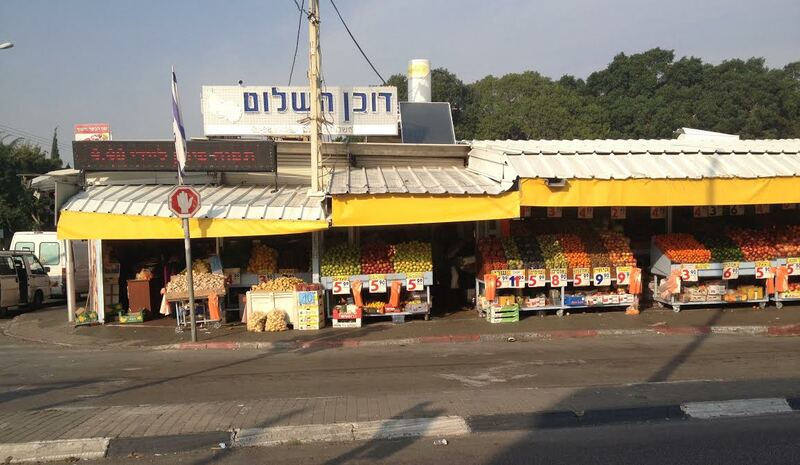 While Ramat Eliyahu may be a developing neighborhood, it is certainly not wanting for access to fresh foods. I think that even some of the “best” neighborhoods in the United States would benefit from having fresh produce available within walking distance of almost every home in the neighborhood.